In this section are all signs related to parking, both prohibition signs against parking as well as signs indicating where parking is allowed. Below are signs that are used to give directions to motorist services on or near the road. These signs are especially used along the Autobahn. Service signs are a symbol in a white field on a blue square or rectangle. Below are signs that give directions or other information. Here are some common additional symbols you may see on signs in Germany. In the past two decades, electronic sign systems have been installed on Autobahns and expressways. These signs are capable of displaying facsimiles of official traffic signs and carry the same authority as their static counterparts. Common signs include speed limits and congestion warnings. When mounted overhead, these signs have added flexibility as they can be used to assign speed limits to specific lanes or to display lane control information. See the "traffic management" section on the Autobahn page for more details and examples. In cities and towns, you will frequently come across convex mirrors mounted on high posts or on the sides of buildings next to the road. These mirrors are provided to help drivers see around tight corners where the visibility is blocked by a building or other obstacle. Words are sometimes used on traffic signs, especially on supplemental signs. Here is a rather complete list of vocabulary used on German traffic signs. 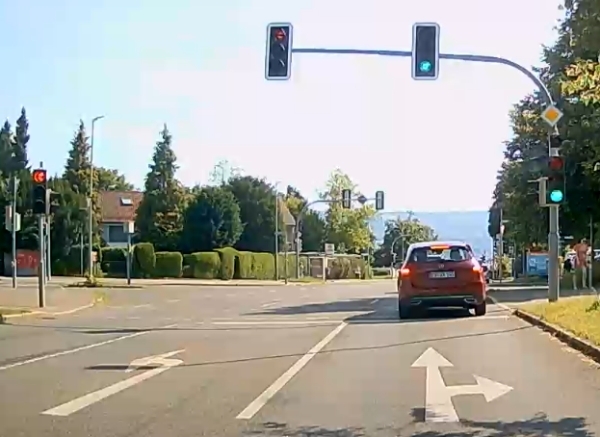 Traffic signals in Germany are the same red-yellow-green type found in the US and elsewhere. Signals are usually located on same side of the intersection as the approaching traffic and are often mounted overhead as well as on the right and left sides of the road. Signals generally operate the same as most other places, but there are a few idiosyncrasies. Below are illustrations and descriptions of various signals and related signs that you will come across in Germany. Items marked with are especially important for US visitors. Figure 1 Traffic signals in Germany use the same red, yellow, and green lights found in the US and elsewhere. Red, of course, means STOP. Green means PROCEED with caution, and yellow means PREPARE TO STOP. In Germany, however, an extra indication is added: just before the light changes from red to green, the yellow signal comes on briefly in conjunction with the red. This means PREPARE FOR GREEN and is helpful if you are driving a manual transmission to give you a bit of warning to get into gear. Figure 1 (left) shows the signal cycle. Some locations have partial signals consisting of just the red and yellow lamps as shown in Figure 2 (right). These function just like regular traffic signals minus the green indication. So, when the green light would normally be on, there is instead no signal. If you come upon one of these signals showing yellow or red, obey it like you would any traffic signal. Otherwise, ignore the signal and obey any other signs or signals, or in the absence of such, use the default right-of-way rules. These types of signals are usually located at railway crossings. Figure 3 Intersections in Germany often have signals controlling each permitted direction of travel, such as the examples in Figure 3 (left). If a signal at an intersection has an arrow for the direction you want to travel, you must obey it. If you don't see a signal with an arrow for the direction you want to go, then traveling that direction may not be permitted; be sure to look for signs. A full green signal without any arrows (like in Figure 1 above) usually means you may travel straight ahead or make a right or left turn unless otherwise prohibited by signs. In the case of left turns, the signal shown in Figure 4 (right) indicates a protected left turn. When the right-of-way for left turns changes from permitted to protected (or vice-versa), a different style of signal is used. In this case, the left turn signal is located across the intersection on the left corner. There are two varieties in use: a green-yellow combination, or a single green signal. The combination signal consists of a flashing yellow arrow (Figure 5 below) or a solid green arrow (Figure 6). The yellow flashing arrow shown in Figure 5 indicates a left turn is permitted but not protected-- use caution and yield to oncoming traffic. When the green arrow is on, as shown in Figure 6, then the turn is protected. In some cases, there is only the single green arrow signal (i.e. no flashing yellow arrow.) Just as in the other cases, the green arrow indicates a protected left turn. If the arrow is off, then obey the signals for through traffic and yield to oncoming traffic when turning left. Figure 7 Always watch for and yield to pedestrians and cyclists when turning left or right. Sometimes there will be a flashing yellow signal like the one shown in Figure 7 (left) adjacent to the other signals warning you that pedestrians crossing the intersecting street also have a green light. Right turns on red are not universally permitted in Germany. However, such a turn is permitted at intersections with the green arrow sign shown in Figure 8 (right) but only after coming to a complete stop and yielding to all other traffic and pedestrians. This is the only traffic law retained from the former East Germany and thus is still somewhat rarely found in the western states, although it is now being implemented more in many areas. Many intersections have special right turn signals. These two-section signals consist of green and yellow arrows and are used to allow traffic to make a free right turn while the signal for through traffic is red. So, if you encountered the signals in Figure 9 (below) and you wanted to turn right, you could do so without having to stop. The cycles for these can vary depending on the phasing for the signals at the intersection; the two most common cycles are shown in Figure 10. When the right turn signal is dark, you must obey the signals for through traffic. A flashing yellow signal or a traffic signal that is completely dark indicates that the intersection is currently not being controlled by the signals. Most traffic signals in Germany are switched off at night and sometimes on weekends as well. Also, some pedestrian crossing signals turn themselves off after a period of inactivity. To provide for traffic control in this situation, nearly all traffic signals also have right-of-way signs installed nearby, usually near the rightmost signal face. Motorists must obey the signs when the signal is off or flashing. So, if you encountered Figure 11 (below), you would have to yield. If you encountered Figure 12, you would have the right-of-way. The signs also provide regulation in the rare event of signal malfunction. Where used, a flashing yellow almost always indicates that you must yield or stop. However, you may have to stop or yield even if there is no flashing yellow-- watch for the signs. There is no flashing red signal in Germany. When the signals are off and you are required to stop, you do not need to stop at the stop line or sign; instead, you should stop at a location where you can safely see the traffic on the intersecting street. When the traffic signals are in operation, the signal takes precedence over the sign. Therefore, if you encountered Figure 13 (below), you would have to stop. In Figure 14, you could proceed without stopping. Road pavement markings in Germany are generally similar to those in the US. Unlike the US, however, all regular road markings in Germany are white, including those used to separate opposing traffic. Yellow road markings are used in construction areas and supersede the regular white markings. Below are diagrams and descriptions of most of the road markings you will encounter in Germany. The light blue numbers on the diagrams correspond to the explanations. You must stop behind the thick solid line across your lane. A thick broken line across your lane is the equivalent to a yield sign (and is often used in conjunction with it.) If necessary, you must wait behind the broken line across your lane. A broken line passing through an intersection along the edge of one of the roadways indicates the path of the priority road. Zebra-striped markings across the roadway mark a pedestrian crosswalk. You must yield the right-of-way to pedestrians in the crosswalk. Zig-zag lines next to the curb mark a specific area (often near a near a bus stop or driveway) where you may not stop or park. Numbers on the pavement in your lane usually indicate the speed limit. Often used during sudden drops in the speed limit for safety reasons. A combination of letters and numbers on the pavement usually indicate route numbers. These are frequently used at complicated intersections to guide motorists into the correct lane. For instance, a marking such as "B27" indicates that the lane you are in follows the B27 highway. Arrows on the pavement in your lane indicate which turns are allowed from your lane. You may not drive in an area with diagonal lines. You may pass only if you have a broken line on your side; you may not cross a solid line on your side to pass. You may not cross the solid center line to pass. An arrow slanting toward the right in the center of the roadway warns passing traffic to merge to the right as a no passing zone is approaching. Short broken lines between opposing traffic lanes indicate that the passing zone is ending. Long broken lines between opposing traffic lanes indicate passing is allowed (unless prohibited by a sign). This marking is also used to separate traffic lanes traveling in the same direction. A solid line along the side of the roadway marks the edge of the roadway or separates the travel lanes from the shoulder. Long broken lines separate traffic lanes traveling in the same direction. Short, thick broken white lines separate a deceleration (exit) lane or acceleration (entrance) lane from the main traffic lanes. Colored curb markings are not used in Germany. Head-in and parallel parking lines are obvious and similar to those used in the US. 2 lanes: The left lane is for oncoming traffic; the right lane is for traffic moving in your direction. 3 lanes: The center lane is reserved for left turns only. You may not pass. The far left lane is for oncoming traffic; the far right lane is for traffic moving in your direction. 4 lanes: The left two lanes are for oncoming traffic; the right two lanes are for traffic moving in your direction. These are usually separated by a single or double solid white line. Even if separated by a broken white line, you may not cross the center line to pass. Odd lane arrangements or assignments are usually marked fairly obviously, either by arrows on the road surface and/or by signs.